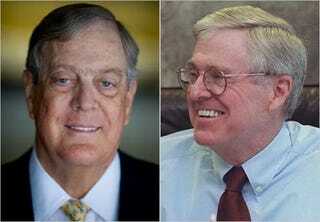 Did Koch Brothers Bankroll Segregation? Trymaine Lee of Huffington Post Black Voices outlines the battle involving the Wake County, N.C., school district, which has dismantled its integration policy. The once national model of school integration was sent backward when a new conservative school board took over, filled with Tea Party members who decided to abolish inititiatives to integrate schools along racial and class lines. The NAACP and other civic groups protested the move because of the correlation between poor populations and a lack of resources as it relates to this school district. Add to the mix Charles and David Koch, billionaire brothers and Tea Party backers who allegedly bankrolled the Tea Party candidates, and you've got a hot, smoking mess. Check out Lee's thorough rundown of the drama in Wake County, including a film that suggests the Kochs bought the election as part of their libertarian approach to politics. Whatever your thoughts, know that if the current plan sticks, it will reverse integration in this school system as we know it. But Wake County’s plan became a political flash point when five conservative candidates, bankrolled by Americans for Prosperity, a political activist group funded in part by the Kochs, were elected to the school board on a “neighborhood schools” platform that would dismantle the existing integration policy. The new board touted their plan as one that would end busing and eliminate class, and subsequently race, as a factor for student school assignments. The "neighborhood schools" plan would assign students to schools closer to where they lived, meaning students from mostly poor and black communities would likely attend schools whose demographics were much the same. White children from well-heeled families would be more likely to attend schools filled with upper-middle class white children and enjoy more resources. Read the entire article at the Huffington Post Black Voices. In other news: Soccer Player's Father Kidnapped in Nigeria.